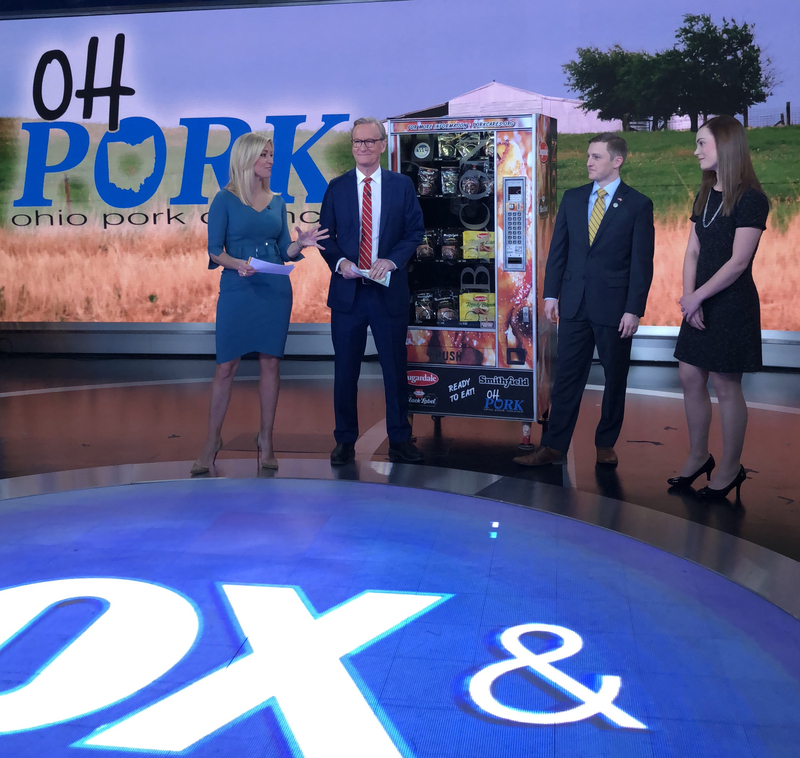 An offbeat idea to promote Ohio pork wound up drawing national and international media interest because, after all, no one had ever heard of a vending machine offering cooked bacon. “Our boss likes to open up meetings by walking in and saying, ‘Hit me with a crazy idea.’ So at that moment we kind of just thought, ‘Why not a bacon vending machine?’” said Meghann Winters, a senior agricultural communication major at The Ohio State University College of Food, Agricultural, and Environmental Sciences (CFAES). Winters, 21 at the time, was a part-time employee with the Ohio Pork Council. She was the council’s most junior staff member when she was given the responsibility to find a vending machine and reconfigure it so that it would offer cooked bacon. “Originally, we were going to rent a vending machine, but that didn’t make much sense financially. So I ended up finding an old, used one on Facebook,” she said. The next task proved to be much toughter: “baconify” the vending machine. Ohio State students line up in the animal science building to make their selections at the bacon vending machine. With some tools and advice from her dad and a lot of Googling, Winters retrofitted the machine to deliver a package of cooked bacon strips or bacon bits after a dollar was fed into it—all of which sounds a whole lot easier than it actually was. “There was a lot of trial and error involved in that,” she said. Configuring the bacon packages to fit within the rows and coils and then fall into the bottom bin proved to be quite tricky. Bacon connoisseurs will likely recognize that bacon is a food that’s usually cooked, then eaten, and isn’t stored like more traditional vending-machine foods. Luckily, a few sponsors stepped up to help: Sugardale, Smithfield, and Hormel donated packages of cooked bacon and bacon bits for the machine. Once this meaty machine was brought to Ohio State’s Columbus campus, specifically to the Animal Science Building, it really sizzled. “We couldn’t keep it stocked fast enough,” said Lyda Garcia, an assistant professor of meat science, and faculty advisor to the Meat Science Club. The club worked to keep the machine stocked and available to students during finals week last December. Four to five times a day, bacon had to be added. As a result, about 275 pounds of bacon were sold over the eight days the machine was on campus. When the Ohio Pork Council approached Garcia, they offered to loan out the machine and supply the donated bacon for a fundraiser for the Meat Science Club. Garcia immediately anticipated that the machine would garner a lot of attention—even from the national and international media. “It was something out of the norm. I knew it was going to fly,” she said. And did it ever fly. Just before the first Ohio State students got to buy bacon from the vending machine, Winters wrote a press release notifying local news stations about the machine. Within hours of sending her release, the story had gone national, then international. With the help of her Ohio Pork Council coworker Emily Bir, all of the inquiries were handled without Winters ever missing a class. The machine drew scores of students, tweets, and Facebook posts, going viral within hours and garnering more than 1,100 news articles and 6,470 mentions on social media over the next week. The New York Times, USA Today, the Associated Press, United Press International, and The Guardian, a British daily newspaper, all took an interest. Media mentions were made in five countries (Australia, Virgin Islands, Germany, Canada, and the United Kingdom), as well in at least 40 states and Washington, D.C.
“I thought a few people would come in, but by the third day, we were sold out,” said Sarah Page, president of the Meat Science Club. Then, they had to get more bacon. And the rush to restock continued until the end of the eight days. Apparently, people liked not only the novelty of it, but also the taste. Then Fox News emailed. They wanted to get the machine on their daytime talk show, Fox and Friends. “We got the email on a Thursday and were scheduled to be on the show that Sunday. We decided to go,” Winters said. There was one small problem, however. Transporting a vending machine from Columbus, Ohio, to New York City isn’t exactly easy. But Winters’ boss, Bryan Humphreys, executive vice president of the Ohio Pork Council, had a pickup truck. “We originally looked into a shipping company, but between price and our rushed timetable, we just ended up putting it in the back of Bryan’s pickup truck and driving all day long to get there,” Winters said. At first, Winters wasn’t on the air. Humphreys was, accompanied by Dave Shoup, hog farmer and Ohio Pork Council president. After the first airing, however, Winters handed out bacon to everyone working in the station. On the ride back to the hotel, Winters got a call from her contact at the station. They wanted her to come back. 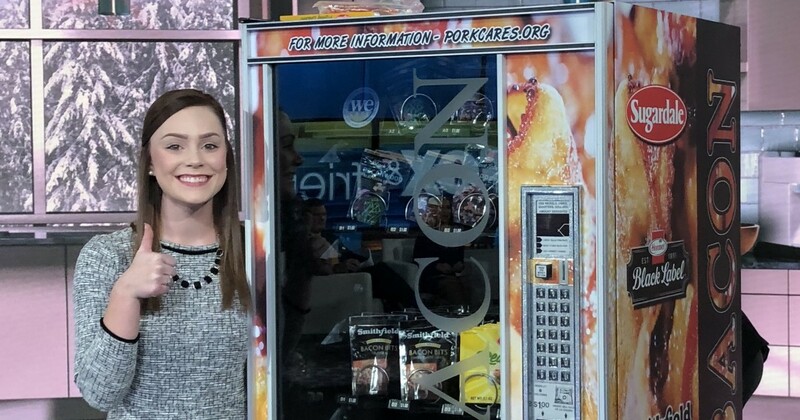 The next day, Winters—the Ohio State senior involved with the “crazy idea” about a bacon vending machine—was interviewed on Fox and Friends, one of the most surreal experiences of her life. On set, the lights were particularly bright. She felt hot and nervous. She hadn’t considered herself a public speaker and this was, after all, national television, and the interview was live. “I told myself, ‘Ok, Meghann, get it together. This is probably never going to happen again,’” she said. She took that as a vote of confidence—parents, perhaps a bit nervous too, wanting their daughter to shine. The Fox and Friends host asked Winters only one question: “Who came up with the idea?” Beaming, Winters explained that it was a group effort. At the time, it felt like the bacon vending machine was in the eye of the whole nation. The future is bright for a lot more than the bacon. Having started this journey as an intern with the Ohio Pork Council last spring, Winters has since been hired as the communications coordinator for the council. A career in agricultural communication seemed a natural progression for Winters, who grew up in Old Washington, Ohio, where she followed her older sister around showing market lambs until she was 9 and old enough to do it herself. Since the hoopla over the bacon vending machine has dissipated, a lot of people have been asking Winters, “What’s next?” Sometimes that’s a little intimidating to consider. Sometimes that’s exciting, as well.